Push the head restraints all the way down . Move the seat back as far as it will go . Pull the loop on the side of the seat and fold the backrest forwards. OR: Pull the loop on the back of the seat in the direction of the arrow and fold the backrest forwards. Pull the loop on the back of the seat in the direction of the arrow. Fold the seat forwards A. 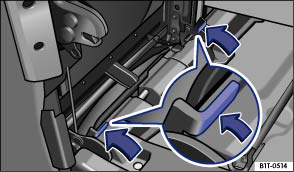 Press both of the locking levers in the direction of the arrow to release the seat catch . 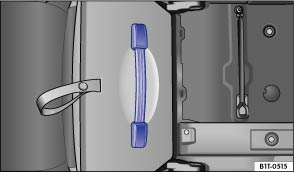 Using the carry grip, remove the seat by lifting it out of the catch . The seat is heavy and can cause serious injuries due to its weight. Before removing, please consider whether you can actually lift it.